Turkey setter- we use the “Sittin Turkey Steamer” and it works great, you fill the inside with beer and it holds the Turkey upright. There are other contraptions that will allow you to put a beer can in but I haven’t tried those. If using a frozen turkey, defrost your turkey. Next, set out your butter so that it can soften. Combine your 2 sticks of butter with half of the herbs and 1 tblsp sea salt and 1 tblsp pepper. The remaining herbs will be used for stuffing into the cavity of the turkey. Combine the butter, herbs and salt and pepper in an immersion blender of food processor until the herbs are chopped finely. Next, wearing gloves, generously rub the butter underneath the skin of the bird in all accessible areas. Some places you will need to make an incision under the skin to losen it. Spread the remaining butter on the outside of the turkey. Sprinkle the remaining salt and pepper on the outside of the bird, rubbing it into the skin. Next, stuff the turkey with the remaning herbs and fruits/veggies. on top of the plate setter. Next, place the sittin turkey onto the drip pan centered into the middle. Pour your beer into the sittin turkey. Next, place your turkey onto the sittin turkey (the sittin turkey goes into the cavity of the bird). Take the wing tips and stretch them behind the bird so they are not sticking out and also cook more evenly. Add your smoking wood at the beginning and be careful not to oversmoke your bird- remember- just a kiss of smoke! Let the turkey cook for about 4 hours (it takes about an hour per 5 pounds) or until the internal temp reaches 165 degrees in the thickest parts (the breast). 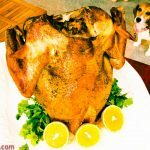 While the directions on the sittin’ turkey will tell you it will take longer, this method has cooked the bird quickly each time so be prepared and have your side dishes ready! This may be the fastest way I know of to cook a 20 lb turkey! Have you done turkey this way before? What was your experience?